We’d love your help. 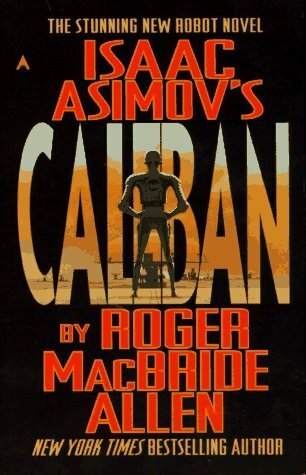 Let us know what’s wrong with this preview of Isaac Asimov's Caliban by Roger MacBride Allen. When an experiment with a new type of robot brain goes awry, the unthinkable happens. Caliban is created... A robot without guilt or conscience. A robot with no knowledge of or compassion for humanity. A robot without the Three Laws. To ask other readers questions about Isaac Asimov's Caliban, please sign up. Is this part of foundation? Armando Loyola This is not an Isaac Asimov book. In his later years Issac Asimov worked to merge his two great science fiction series, the Foundation and the Robot series. The problem he faced was that the events of the Foundation Series had to come after the Robot series, but robots were utterly unknown to the Foundation or the empire it replaced. That Asimov pulled this off was no mean feat, but not an incredible one for someone who figured out how Plutonium-186 could exist. In the process Asimov created an entirely new world with hundreds o In his later years Issac Asimov worked to merge his two great science fiction series, the Foundation and the Robot series. The problem he faced was that the events of the Foundation Series had to come after the Robot series, but robots were utterly unknown to the Foundation or the empire it replaced. That Asimov pulled this off was no mean feat, but not an incredible one for someone who figured out how Plutonium-186 could exist. In the process Asimov created an entirely new world with hundreds of thousands of years of history and countless stories to fill in Since Asimov's death in 1992, his estate has granted a number of prominent science fiction writers to fill in those gaps. On reading a few of these stories (all dealing with the Foundation), I've come away disappointed. In some cases the plots are strong, the narratives plausible, but they don't have Asimov's muse. In other cases they take a single thesis or motif too doggedly—affecting Asimov's style, but wearing it on the book-jacket. When my dear wife found Caliban at a used bookstore, I was prepared for disappointment. To my surprise, Allen got it mostly right. Caliban reads like Asimov at his best but better. Allen even managed to turn one of the Asimov's weaknesses as a writer into convincing story telling. There are times where the characters in an Asimov novel give themselves over to long lectures or the sort of Socratic “dialog” where the only point for more than one speaker is for the main character to catch her breath. These sequences tended to feel artificial, as if the characters are really talking to the reader and not each other. Many writers now trust the reader to figure out the science or quasi-science as story progresses. Such dialogs also felt misplaced for the pacing the same way an opera singer may go on with an extended aria after having been mortally wounded. Allen actually uses this technique in a couple of real lectures and a police integration, and does so in such a way as to move the plot and engage the reader, not just provided information that the action could not. As with the early robot books featuring Elijah Baley and Daneel Olivaw, Caliban is a detective story. Like those early stories, the detectives are a human and robot team. In this case the human is the Sheriff, Alvar Kresh, and his robot Donald (minor curiosity, why is it not “Donaal,” since he was built several centuries after Daneel?). 1. A robot may not injure a human being, or through inaction allow a human being to come to harm. Any robot coming into any conflict with any of these laws can suffer permanent and catastrophic brain damage and simply cease to function. Even so, it slowly dawns, first on Donald and then Kresh, that a robot might have been involved in such a horrific crime. That robot is Calaban, and Calaban would seem to be unique among robots in some very fundamental ways. All the action takes place on the planet Hades (yes it is rather arid) in and around the city of Purgatory (and yes, these sort of place-names continue to crop up). Hades is in a life-or-death environment crisis that would make the worst predictions for terrestrial global warming look like a minor inconvenience. The inhabitants of Hades are members of a loose alliance of forty-nine (at one time fifty) planets known as “Spacers.” Spacers, initially being more advanced, left Earth early on as doomed and took their robots with them. The three laws are for Spacers all but sacred, and life without robots unthinkable. The Settlers left Earth later and had become more advanced in every area but one, robotics. Settlers have a righteous disdain for robots. Although neither side trust the other, the environmental crisis Hades finds itself in, has joined these two groups. The Spacers cannot be moved to avert their impending doom on their own, and Settlers are looking for new worlds to inhabit. There are also internal difficulties among the Spacers themselves, aggravated in large part to the intrusion of the Settlers. Players in each of these camps (including members of Leving's own robotics lab) become suspects. As one might suppose, no crime scenario that Kresh spins out makes much sense. Intertwined with the mystery is a serious critique of robots, or more specifically the Three Laws. The critique comes in two forms, in a couple of academic lectures. These lectures/essays are thought provoking and lively in and of themselves (and the ensuing riot the follows the second lecture is also entertaining). Part of the critique is that the three laws enslaves and degrades a class of intelligent beings (robots) in such a way that would not be tolerated in with anyone else. In so commodifying such beings, humans are themselves degraded. If you are hearing an essay on the evils of slavery for both slave and master, you would not be far off. The other line of argument is that dependence upon Three-Law robots is the cause for the decline of the Spacers. Here the lectures get into trouble. Asimov had several lines for the decline of the Spacers, robots being only a minor line of inquiry. Moreover, it is difficult to see why dependence as decline cannot equally be applied to the Settlers' technology. Is an aircar piloted by a robot any more decedent than one that can practically fly itself? More powerful than the lectures is how Allen portrays the society of Hades. It is a society where people do no work, can do nothing for themselves, create nothing of value, and where the citizens are so many monads, slowly spinning in their own windowless rooms; where robots not only do all the work, but do work for which there is no need and work that is beneath their dignity. Hades is a narcissistic society whose breeding ground is the absolute lack of anything that might impeded humans reaching their full potential. As with any good detective story, Caliban has all the players racing for a final confrontation where the truth finally comes out, in this case by piercing deduction combined with a theatrical slight-of-hand on the part of Kresh and Donald. As one might hope, the solution to the crime dispenses with all the previous theories but still manages to fit the facts of the case. Allen provides everything the reader needs to finger the culprit, and the solution is both obvious and elegant in retrospect. Since writing Caliban, Allen has gone on with two more books in this series, Hades and Utopia. It is perhaps for this reason that Allen ends Caliban with hopeful epilogue rather than one that presages the difficult and finally futile effort for Spacer society to survive. Summing up: Recommend for those who have enjoyed the works of Issac Asimov and anyone who likes classic detective fiction, albeit in an Asimovian setting.manages to fit the facts of the case. Allen provides everything the reader needs to finger the culprit, and the solution is both obvious and elegant in retrospect. Ok but you can tell it's not Isaac. Originally published on my blog here in May 2002. In recent years, this kind of "collaboration", billed on the cover of Caliban as "unique", has become quite common. Basically, someone who is a relative newcomer as a writer (and almost anyone would have fallen into this category when compared to Asimov in the early nineties; Allen was a reasonably well established author) takes a classic piece of science fiction and writes a new novel or series based on it and under the supervision of the origina Originally published on my blog here in May 2002. In recent years, this kind of "collaboration", billed on the cover of Caliban as "unique", has become quite common. Basically, someone who is a relative newcomer as a writer (and almost anyone would have fallen into this category when compared to Asimov in the early nineties; Allen was a reasonably well established author) takes a classic piece of science fiction and writes a new novel or series based on it and under the supervision of the original author. The results are frequently surprisingly good; writers other than Asimov who have allowed their work to be used in this fashion include Anne McCaffrey. The benefit of course is that these novels have a ready-made appeal to fans of the original, and many authors of successful novels have a problem fulfilling the demands of their fans and publishers for more of the same. (They frequently want to move on to something related to current interests - and develop as writers.) Also, the younger writer may well have ideas which put a science fiction classic in a new light. The major flaw in Caliban for me is the way that the research into replacing the Three Laws is described. It is said that the laws are impressed into the design of positronic brains at a fundamental level, with the result that new laws require the development of new hardware, the gravitronic brain. This is stressed throughout, but seems extremely unlikely to me, being based on identifying hardware and software in a way which has never been a big part of the design of the electronic computer. (It may come from ideas in some of Asimov's early stories, where computer Multivac is described in mechanical terms.) Even if the laws were partly encoded in hardware, it surely wouldn't be difficult to redesign the positronic brain either to move this encoding to software (as the most difficult part of getting a computer to follow the laws would be to provide sufficiently usable definitions of concepts such as "human", "harm" and so on) or to redesign the hardware to cope (working to redefine things in a familiar environment being far easier than at the same time having to work in a completely new background). Even the way that conflicts between the laws cause the robots to freeze up makes the whole setup seem more like software than hardware. Caliban (Robot CBN-001) came into consciousness standing above the motionless body of his creator, with no knowledge of why. Things are already tense on the planet Inferno, where Spacer and Settler have formed an uneasy truce in order to save the planet from environmental disaster. The last thing anyone wants to deal with is a robot who might be capable of murder, and it doesn’t take Caliban long to find out just how unwelcome his existence really is. As the first in a trilogy written in Asimov’s universe, Caliban delivers the most important things a fan of Asimov’s robot stories would be looking for. First of all, Allen “gets” Asimovian robots—he understands the limits, strengths, and weaknesses of the Three Laws of Robotics, and never crosses the line into misinterpreting them as so many adaptations seem to do. Instead of corrupting Asimov’s laws, he finds ways to introduce new types of robotic problems which feel firmly at home in the context of Asimov’s original universe. The Spacer-Settler antagonism of the original series is preserved despite the fact that on Inferno both must work together to save the planet. In some ways things are inverted from the situation in the Caves of Steel—for instance, instead of Spacetown we have Settlertown. The Settlers have come to try and save the Spacers rather than the Spacers coming in half-feigned benevolence to the people of Earth. But as always, the ways in which robots affect human progress are integral to the plot. Allen’s writing style is similar to Asimov’s in some respects. He is not afraid of dumping paragraphs of information on the reader while the central character is engaged in some activity which allows his or her mind to wander. In some genres this would make for extremely dull and frustrating reading. I will admit at times it goes beyond necessary exploration and ends up becoming repetitive, sometimes stating the same thing in multiple ways. But for this sort of book, knowing the psychology of each character is extremely important. More than murder or escape or riots, these books revolve around trying to unravel why people and robots do the things that they do, and how what they do reflects who they might really be. The excitement is primarily intellectual. Much like Elijah Bailey, the main character Sheriff Alvar Kresh has to understand human beings in order to do any sort of detective work. We are taken along for the entire messy process of untangling the who, why, and how of the attempted-murder mystery. I have done my share of feeling frustrated with Allen’s long-windedness, but if the ending can bring me close to tears, he must be doing something right. His robot characters are very strong, each one as individual as Asimov ever made his, perhaps more so. It is difficult to strike the needed balance between giving a robot a noticeable personality and still sticking to the robotic element or “feel”, but Allen succeeds, making each robot memorable and distinct. Caliban is of course the easiest to connect with, being the main character and in some ways more human than most of the other robots. But Donald—Kresh’s personal robotic assistant in the pursuit of justice—also has a very strong personality due to being programmed for police work, and there are at least two other robots who are given short but important roles in the story. As for the humans, Kresh is very Lije-like as he plays his role of the overworked cop trying to keep the city of Hades from going, well… to Hades. He’s not exactly the same, and I don’t think Allen intended to copy Elijah’s character so much as give a nod to the original stories which inspired his work. The other main human characters don’t stand out as much in this first installment, although they weren’t bad, and there were two notable female characters: Fredda Leving (Caliban’s creator) and Tonya Welton (leader of Settlertown). Fredda definitely comes off as the stronger character. She seems better-rounded in her motives and desires, while Tonya has many elements of a good character but they fail to come together in a way which feels real. In context of the mystery, she seems motivated primarily by relationships with the males in her life despite putting on a show of being independent and powerful. She could have been more complex, and the romantic subplot could still have been preserved and perhaps even added to that complexity, but as it is I never really connected with her character like I did with Kresh and Fredda. Still, her presence in the story is good for representation as a powerful woman of color who is about average in the motives that drive her. I also appreciated the presence of an important “female” robot who was not sexualized in any way (and the only feminine thing about her was her name). Finally, the plot had all the complexity a mystery should. The best thing is that Kresh and Caliban, as the two main characters, are both in the dark about what is really going on, and both are in a race to find the truth even while getting in each other’s way—Caliban by inadvertently creating panic over a rogue robot, and Kresh by having to try and calm that panic in the midst of a delicate political situation. Neither are enemies except in a circumstantial sense, although Kresh certainly is uncomfortable with the mere idea of Caliban and all his existence means for the future of Inferno. There is no absolute good or evil here, which leaves ample room for realistic philosophizing over many relevant aspects of society. And, Kresh is convincingly human in his inability to jump to the right conclusion for most of the book, being led down false trails and dead-end streets more often than not, despite assistance from Donald who is in nearly every sense Kresh’s equal in detective work. I had read this trilogy before but I had completely forgotten who the perpetrator actually was! Therefore I was able to re-experience nearly all the speculation and confusion I had the first time around, and had no idea who was guilty until the big reveal. And, even better, the big reveal was not only surprising in an intellectual sense, but it felt like a true climax in an emotional sense, as everything, all the questions—all the characters’ private hopes and fears—came to a head. The slow build up was well worth it, and the ending leaves just enough questions open to make the perfect hook for the next book. No frustrating cliffhanger, just a burning curiosity for what happens to the characters (and the planet) next. For anyone who loves Asimov’s robot stories and wants more robot characters to love, I highly recommend Caliban! Once you’re done, I’m sure you’ll want to join me in reading the sequel, Inferno. "Sheriff, get some sleep!" - that's what my mind was saying practically the whole book. Mostly I liked this tale, even though there was a ton of exposition. The only truly developed characters were the Sheriff and Caliban himself. Maybe in sequels others will be fleshed out? Although I enjoyed this, I'm in no hurry to read the next installment. I'm sorry my review is just scattered thoughts. Thank you for reading it! A sad spinoff from Asimovs great works. Only read this if you are a great fan of Asimov and want some perspective. This is really a three and half star book. It was my second time reading the book. The author made some good points in bringing out how the robotic society was a slave society and how dangerous that was for human. There was also a waste of the usefulness of the robots as they would be used for meaningless work and not for their full potential. An intresting book with some good quotes. I underlined quite a bit. Someetimes it dragged a bit but, overall a good job. Pretty good for those of us who always enjoy the Asimov robot books. Fairly predictable plot if you have read other books by Asimov. What are robots good for? And by the way, what are humans good for? That's a question I won't try to answer tonight. I really wish goodreads had half stars. This book is more like a 3.5 to me. It’s basically a mystery novel set against the backdrop of sci-fi. Which I didn’t love love. I mean I like mystery novels too, but with a title like “Isaac Asimov’s Caliban” I was expecting much more sci fi and thus found myself to be disappointed. However! It DID have some great and in depth sci-fi scenes- like a VERY comprehensive discussion and dissection of the Three Laws of Robotics, which I thoroughly enjoyed. I’m n I really wish goodreads had half stars. This book is more like a 3.5 to me. It is difficult because Asimov became more left progressive and collectivist in his writings as the years went by. His Robots for the most part were better "people" than the people in the stories. Same for decisions being made they were very much Social Justice warrior oriented and usually done by an elite. That said there were many people in the stories who were good and etc. This story starts with the premise that Robots, highly evolved robots are sentient beings and so should be considered as It is difficult because Asimov became more left progressive and collectivist in his writings as the years went by. His Robots for the most part were better "people" than the people in the stories. Same for decisions being made they were very much Social Justice warrior oriented and usually done by an elite. That said there were many people in the stories who were good and etc. This story starts with the premise that Robots, highly evolved robots are sentient beings and so should be considered as beings in their own right. See his Bicentennial Man. So this book assumes an AI so advanced that you do not need the 3 laws but they will naturally learn them on their own and, implied, be much better than humans in their execution. This was an excellent book showing a really good insight into where we are heading with robots doing our every day tasks. It does rely on Isaac Asimov's robot three laws - but if you put that to one side and just read it as independent of that - without trying to compare it to Isaac Asimov's writing, then you will really enjoy it. Its a complex story but I found it easy to follow and very interesting in the way it looked at the robot / human interaction. I read this book well over 20 years ago. I'm sure somewhere in my over crowded library I own a copy of the book. This is one of those books that makes you think a lot. Tedious to read in places but overall pretty good. Caliban is the first in a trilogy of stories set in Asimov's Robot universe. The book is a mystery thriller, and also an exploration of the social and political consequences of robots, robotics and the three laws. This is an accessible and easy to read novel, even if you have no background in the Asimov universe. But it will be especially enjoyable for those who've read the early Asimov robot short stories and understand the format of the intellectual puzzles that underlie the use of the three l Caliban is the first in a trilogy of stories set in Asimov's Robot universe. The book is a mystery thriller, and also an exploration of the social and political consequences of robots, robotics and the three laws. This is an accessible and easy to read novel, even if you have no background in the Asimov universe. But it will be especially enjoyable for those who've read the early Asimov robot short stories and understand the format of the intellectual puzzles that underlie the use of the three laws. The book takes a spacer planet as home, and populates it with spacers, settlers and new kinds of robot. Its core characters are interesting and engaging, if not particularly alien or surprising. The text is lively and the action relatively fast paced, making it hard to put down until completely read. Each book in the trilogy has a clear and satisfying conclusion as well as leaving some threads open. The weakest part of the book is actually the view of the future - there are few ideas in this story (aside from those about robotics) that is unusual or creative. The setting is a predictable with aircars and spaceflight but very little game-changing innovation. However, much of this is constrained somewhat by choices Asimov already made. Overall I enjoyed this book a lot and would strongly recommend it to a SciFi/Mystery reader. www.r Despite the fact that Caliban was not written by Issac Asimov, it holds true to his style and tradition. We see Asimov's tried and true method of storytelling in the elements of futuristic crime solving-- a la Elijah Bailey-- and the application of the three laws. Where Allen shines in the storytelling of Caliban is the development of the New Laws and the ultimate robot, Caliban, who exists with no laws other than the laws he creates for himself. A great read for fans of Asimov! This was a much better book than most of the other garbage published in Asimov's name. The story started off like a good mystery with a robot apparently having hurt a human. After the initial rush though, the story takes on a different personality and not much happens in the way of plot development until about 2/3 in. At that point, things get interesting again and it leads to an unexpected but not altogether fascinating ending. One major downfall to this book for me was once again character names This was a much better book than most of the other garbage published in Asimov's name. One major downfall to this book for me was once again character names. The robots are all named after Shakespeare characters: Caliban, Ariel, Donald, Horatio. These are normal and acceptable names. The humans, however, are a different story. We get Alvar, Fredda, Chanto, Simcor, Gubber, & Jomaine. Having completely unnatural names takes me out of the experience of reading the story every time I see the name. I just don't see how such creative people can completely drop the ball here. I finally got around to reading this series, and, well, I can understand why several times I started to read, put the book away, and never came back. The three novels tell the story of how the planet Inferno is saved from its original, faulty terra-forming. Along the way new robots, with a modified set of 'Asimov' laws are created. The story is competently written, but that is all. No spark of creativity, the characters are listless, going through the motions. The robots perhaps show more charac I finally got around to reading this series, and, well, I can understand why several times I started to read, put the book away, and never came back. The three novels tell the story of how the planet Inferno is saved from its original, faulty terra-forming. Along the way new robots, with a modified set of 'Asimov' laws are created. The story is competently written, but that is all. No spark of creativity, the characters are listless, going through the motions. The robots perhaps show more character than the humans? Or is that saying too much? Allen has written a thoroughly enjoyable story, taking Asimov’s three laws to the next level and skillfully balancing action, politics and the characters self discovery. And yet… and yet I soon felt like I was reading yet another Asimov robot novel. Yet again a sleuth accompanied with a faithful robot sidekick trying to solve yet another crime with a robot as the main suspect. Yet again a crime the robot couldn’t have done because of Asimov’s three laws. Yet again spending far too much time insi Allen has written a thoroughly enjoyable story, taking Asimov’s three laws to the next level and skillfully balancing action, politics and the characters self discovery. And yet… and yet I soon felt like I was reading yet another Asimov robot novel. Yet again a sleuth accompanied with a faithful robot sidekick trying to solve yet another crime with a robot as the main suspect. Yet again a crime the robot couldn’t have done because of Asimov’s three laws. Yet again spending far too much time inside the characters head contemplating the meaning of the three laws. While Allen writes a good story here, there‘s not enough original thought to inspire me to purchase the next Caliban book. Entro a puntuar este libro solo porque GR lo recomienda "ya que muestas interés en Isaac Asimov". Pues bien, comparar esta trilogía de Calibán con Asimov sólo por la portada es casi pecado. Supongo que sus herederos habrán sacado pasta por permitirlo, pero está a años luz de distancia de la obra del Buen Doctor. En la portada del libro ponía "ISAAC ASIMOVS CALIBAN" y salía el dibujo de un robot y estaba de oferta….vamos, que me engañó. Llegó al 5/10 pero prescindible. Lo peor es que no compré uno, Entro a puntuar este libro solo porque GR lo recomienda "ya que muestas interés en Isaac Asimov". En la portada del libro ponía "ISAAC ASIMOV´S CALIBAN" y salía el dibujo de un robot y estaba de oferta….vamos, que me engañó. Llegó al 5/10 pero prescindible. Caliban, Inferno, and Utopia are a trilogy written in a universe that Isac Asimov created. They are Sci Fi Mysteries. Yes, the names are from Shakespeare. They are also sanctioned by Asimov himself, a few years before his death. Caliban is a robot without the three laws of robotics. An impossible crime is committed and Caliban is a suspect. The writing is very good and it fits nicely with Asimov's Sci Fi Robot Mysteries. Caliban is the best of the three, but the others are very good also. The last Caliban, Inferno, and Utopia are a trilogy written in a universe that Isac Asimov created. They are Sci Fi Mysteries. Yes, the names are from Shakespeare. They are also sanctioned by Asimov himself, a few years before his death.